There’s a new Cowboy in the Virginia Highland neighborhood of Atlanta. Well…sort of kinda. Taco Cowboy is Chef Tom Catherall’s relaunch into the Atlanta restaurant world. Chef’s backstory as the owner of some of Atlanta’s most popular restaurants, e.g. Goldfish, AJA, Prime, Twist, Shout, Strip, Shucks, Smash and Noche, could very well have been a food reality TV show. Even Chef Cathrall’s newest restaurant comes with some drama. Opening as Tom Tom a legal battle forced a new name resulting in a menu change and new branding. 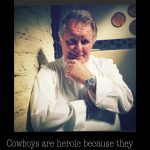 Chef has that old fashion cowboy value ~ Grit. Courage. Passion. Endurance. Creativity. When Malika Bowling, Atlanta Restaurant/Association of Food Bloggers, invited me to special food blogger tasting at Taco Cowboy I quickly agreed. I must admit I was damn curious to experience Chef Catherall’s newest adventure into the culinary arts. 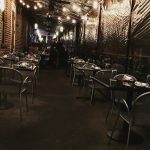 Walking into Taco Cowboy you find yourself at the beautiful bar which sets the tone the restaurant is positioned to be part of the neighborhood. Walking further into the space you pass some interesting Western art along with some fun pop art posters. Although the dining space is small it felt intimate and not at all cramped. If you prefer dining alfresco the outdoor patio is heated and a fun way to enjoy your meal. It’s especially pretty at night. 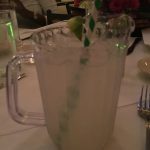 Each food blogger was treated to her own personal size pitcher of tasty, very tasty (!) Tom’s House Margarita. Actually the little pitcher holds several glasses but with the retro straw it was just a little naughty to drink right from the pitcher. The Snack part of the menu is diverse and we were lucky to taste several dishes. I can definitely see dropping by Taco Cowboy, after shopping in the Highlands, for drinks and snacks. 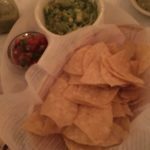 To nibble on with our Margaritas were first served Salsa Duo, Guacamole & Chips. That was followed by Baked Queso. What is it about warm ooey, gooey cheese that is the comfort language of so many cultures? With the crunch of the chips the Baked Queso was one of my faves. Don’t you love the way it’s served in these cute little cast iron skillet? Next up was a very refreshing Cervice of shrimp, avocado, tomato, radish, cilanto and lime. The flavor profile was perfect after the rich, creamy Baked Queso. 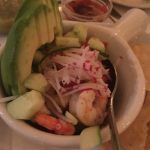 The shrimp had the right bite while the avocado added creaminess but the much needed radish and lime set it apart. True to its name Taco Cowboy does serve tacos. However, these are not your usual Tex-Mex (nothing wrong with that) taco offerings. Chef Catherall elevates the taco to a sophisticated level while also keeping the southern influence of Atlanta top of mind. 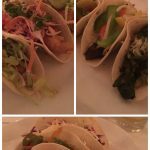 From two kinds of fried chicken tacos to Korean beef with kimchi and the ever popular fish taco you quickly can tell this is not your usual taco menu. The over the top surprise is a lobster taco with a cascabel sauce. Growing up in Boston I can tell you this is really unique! As you can see the tacos are reasonably priced and the servings are generous. If you’re in the mood for a light lunch or late dinner this might be the way to go. Not in the mood for a taco? Taco Cowboy’s entree menu is as diverse and delicious. 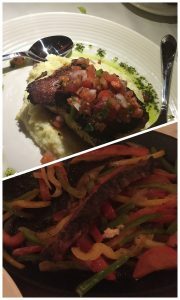 We were served three of Taco Cowboy’s entree dishes — BBQ Salmon, Fried Chicken and Skirt Steak. As I’ve mentioned in other posts, I’m not so much a fan of grits but the BBQ Salmon on the bed of creamy jalapeno grits was wonderful. The flavors were big and bold as befitting a cowboy. Dessert! Two words to describe Taco Cowboy’s desserts ~ Comfort Deliciousness. To end our Taco Cowboy taste we were served three desserts — Pumpkin Cobbler, Served with Vanilla Ice Cream & Caramel Sauce Apple Pie and Apple Pie Tacos. While I loved all the Apple Pie Tacos were a fun play on traditional apple pie. 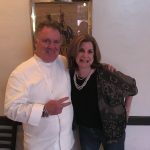 My thanks to the staff, Chef Tom Catherall and Lisa Rayner for a divalicious food blogger tasting. Next time I’ll wear my cowgirl hat! Yes there is a (new) Cowboy (back) in town! Welcome home Chef. The Taco Cowboy meal was complimentary as part of a blogger influencer program affiliated with Association of Food Bloggers . All opinions are those of the author.